This tabbed necklace was made almost entirely from one slice. You may have heard that a designer friend and I have developed a new slicer for polymer clay. The slicer (which will soon be on the market) cuts paper-thin slices as large as 4″ x 4.5″ from a block of clay. I introduced the slicer in my presentation “One Cane: Many Possibilities” at the IPCA Synergy Conference last February. Since then, Julie Eakes has purchased a slicer and has written about it in her blog. The slicer is not just for canes, though. The ability to slice a full sheet of clay as as thin and as large as this has created all sorts of new possibilities for mokume gane as well. Lately, I’ve been creating my own impression plates the full size of the billet and using them to impress a set of connected patterns on a single sheet of clay. This tabbed necklace (above) was made almost entirely from one such slice. I will be showing other pieces made from full sheets soon; meanwhile, here are some pieces I’ve made from parts of these very thin slices. I’ll be teaching the impression plate technique in a new class I am developing. This entry was posted in Cane Slicer, Classes/Workshops, Metallic Clay and tagged Carol Simmons, Color, Color Mixing, impression plates, Kaleidoscope Canes, mokume gane, polymer clay, Polymer Clay Classes, Polymer Clay Colorado, Polymer Clay Teachers, Polymer Clay Techniques, Polymer Clay Workshops, stamps. Bookmark the permalink. Very cool. I want to see this slicer. Love the Mokume Gane. Beautiful. Thank you. I’ll post updates on this site. Yeah! Can’t wait to see the slicer. I’ve been wanting that for years…just needed someone else to invent it! I’ll post updates on this site. Carol, it has been awhile since I’ve seen your work. As usual it is precise and elegant. 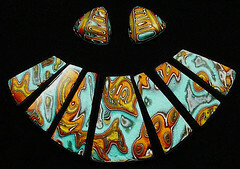 I love the colors in your mokume gane pieces and look forward to seeing that slicer. Thanks Cynthia. I’m looking forward to seeing what you have been up to next September! Gorgeous work Carol- and btw- my daughter and sil LOVE the earrings!!! Thanks, Gera. Hope things are going well out there. It’s good to hear from you. Missed you last August. hello carol! So nice to see you have a blog! I love looking at your incredible work! hope to see you next fall! Good to hear from you and thanks for reply about teaching. With luck we’ll see eachother before next fall! These pieces are wonderful. Those colours reminded me of the Newari gold and turquoise jewellery here but much lusher! (Is that a word?) Here in Nepal, we (one wandering Australian and a group of ladies making gorgeous polymer clay jewellery which they sell to earn their own incomes and hopefully get out of pretty awful situations) have been discussing the need for a “slicing thing” so we’d LOVE to hear all about your “slicing thing” when you are ready!!! It would become the most used slicer in the world I think. Please let us know when it is available. Warm regards and keep blogging! We can possibly access here it at the rate you write it. I’ll be in touch when I can tell you more. Cynthia Tinapple is a good friend and will be in Nepal next year, so maybe we can actually get one to you. I’d love to purchase a slicing machine! Please let me know when it’s available for sale. Can you let me know when this slicer is for sale in the Netherlands? I’ll have an update on the slicer in a month or so. I have you on my mailing list. Your slicer sounds wonderful, Dorothy. It is truly wonderful, but it is awfully expensive. I hope eventually to come up with a smaller, less expensive one.